In Rockwall and all over the DFW area, we endure heavy winds and storms that can damage our roofs beyond repair. When this happens, the first thing to do is call your Insurance Company, then a roofing company. Insurance Companies like to set prices that please them. Typically, they will allow you enough money to replace a roof, but that's not always the case. We at Rockwall Metal Roofing have dealt with our share of insurance Companies for Roof Replacement in Rockwall. 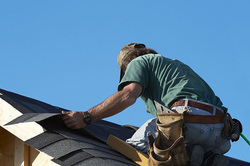 We understand the hassle and headache that is associated with Roof Replacement. Let us take the headache away by removing the worry of financing. We will work within the budget your insurance company gives you. And if we believe it's not fair amount, we'll contact them for you. Having a new Roof Replacement in Rockwall, Mesquite, Forney, or Garland doesn't have to be a hassle! Our Professional Contractors know the climate and DFW area, and can make Educated Recommendations for you on behalf of your roof. No matter the type or style of roofing you'd like to have installed, we can do it. Our Knowledgeable Team of Workers are Certified with all major Roofing Product Manufacturers and are Knowledgeable in the methods. When you hire Rockwall Metal Roofing, you are allowing Integrity, Honesty, and Efficiency on your roof. Call us today if you have any questions or to schedule a Free Estimate for Roof Installation.